I’d like to invite you to help us with our Empty Bowls event this year by creating the bowls that are donated to FFLC to be sold at this annual project. 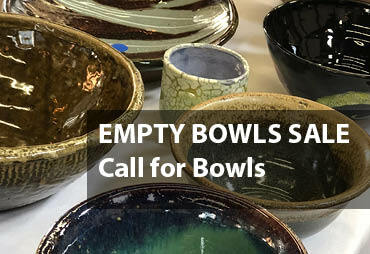 FOOD For Lane County’s Empty Bowls Sale raises about $15,000 (45,000 meals) each year to help feed neighbors in need. This year it will be held May 3rd from 4-7 at The Dining Room (280 W. 8th Ave., Eugene, across from the WOW Hall). Please RSVP by April 15th with the number of bowls you are able to donate, so we know how many tables we need to set up at the sale. We will need your donations by May 1, 2019 so we can prepare them for sale. Please bring them to the FFLC Warehouse, located at 770 Bailey Hill Road. Info about the Bowls Sale on May 3. If you have any questions about this request, please contact me. Thank you Empty Bowls sponsors!